Evander daughter and half Alianza! Simply put, Evander produced amazing progeny with the ability to produce multiple blue ribbon and Championship winners. Evander recently passed away. He was a proud, full-Peruvian son of Inca's Ransom, a solid male with dense, bundling crimp and a magnificent head. Evander's offspring are exhibiting astounding fleece character, coverage and conformation and seem to be inheriting their Sire's magnificent "head". 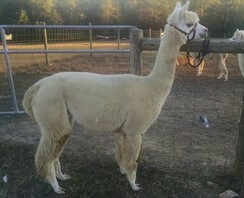 Evander has put his stamp on the US Alpaca world with quality and dependability in his offspring. Midnight Sun was purchased at the 2005 Parade of Champions auction by Chase Tavern Farm and were "smitten". She if full Chilean. The Pategonia herd is well known for excellence. Mysia is a beige Evander daughter and her dam is Patagonia's Midnight Sun. She is very personable--a joy to watch--proven and has great coverage, style, and strong bone. She is a super mom and very attentive with her cria. With Evander as sire, who was full Alianza, & her dam, Midnight, a dark fawn, her color potential in future production is good. We have only bred her to white. She has superb conformation, a great staple length, nice density and crimp definition, & a soft, soft handle. Roving made from her fleece is a real pleasure to spin, and sells well. Whether you are wanting fiber, good breeding genetics, a companion, or all three, she's definitely one to think about. 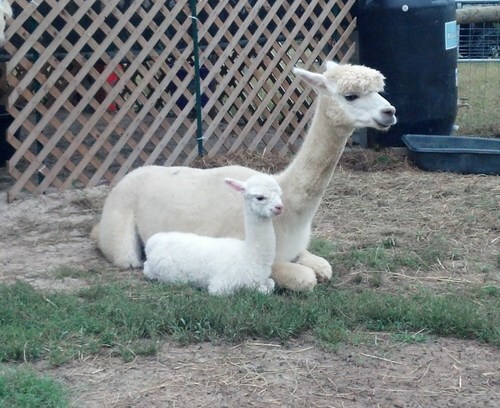 She is shown here with her first cria, Luke, born October 2013. She is a good mother, attentive, and produces ample milk. If you are looking to start a herd or add to your foundation stock, she is an excellent choice with an affordable sales price. We are flexible. Alpaca financing generally involves a down payment with the remainder due within six months. Alpacas remain agisted on the farm until payment is completed.